Is a blue fever and I got the fever for all things blue and denim. From runways to streetstyle, it seems like the denim is here to stay. I love this denim shirt on Alexa Chung. I like the the mix of floral with denim--feminine with an edge--definitely my style especially with the boots. Thoughts? Would you wear denim on denim? I am so loving everything in denim this season! 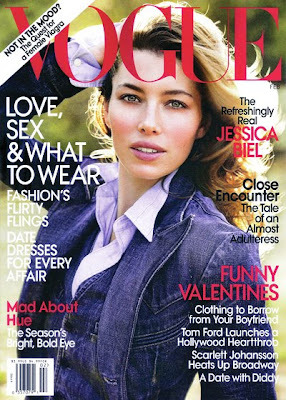 The Vogue cover of Jessica was so great! nice blog, u should check out mine i think u will like it :) well hope u do..
see the latest fashion trends, photos, tips and a lot more. looks like i'm going to have to search for head to toe denim! I want new denim shorts sooo badly! i never thought i would like denim on denim but alexa looks so chic!